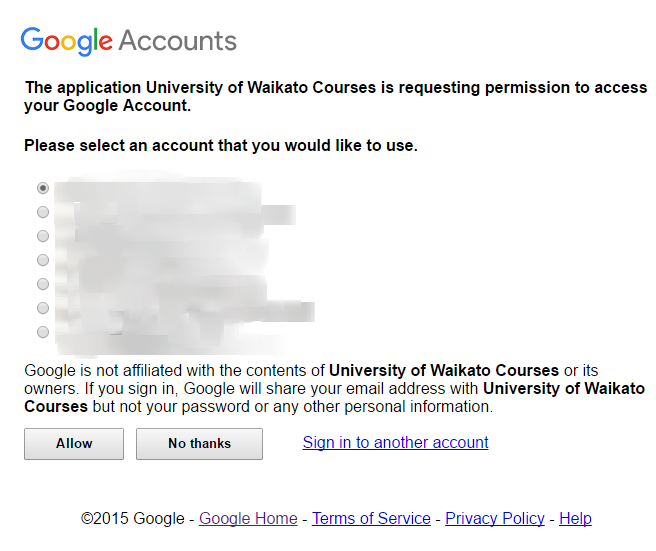 I recently registered to a site that uses Google Course Builder (more specifically Data Mining with WEKA) using my Google Account, but I cannot find any section in my Google Account Settings that lists the permissions that I have granted to this site and what sites like this I have granted permission in the past. I have searched in this list as proposed by this answer but the site was not listed there. Any ideas on where it is and how to view this list of sites? You should ask for the name of the apps used on the related course to each course responsible. Google Course Builder isn't a Web App. It's software and guidelines that could be used to create online courses which in turn could work as web apps. Each course could include one or several components that requires user authorization but the name of each component depend on each organization or even individuals behind each course / component. Course Builder is an Open Source (Apache 2.0), online education platform. Use it to create your online course whether it's for an entire university offering, professional training, or a corporate product. When your site requires access to private data (such as a file on Google Drive), the owner of the account will be asked to consent to the access. To prepare the consent screen to ask for access, you must provide a product name and an email address. Click the OAuth consent screen tab. For Email address, select one of the valid addresses. For Product name show to users, enter the name of your course or site. Considering ignoring the other fields, which are optional. How to find a list of sites that I've authenticated with using my Google OpenID? Which Google services have I signed up for?